Dolphin Summer (1963) is almost entirely devoid of ponies, but it does have plenty of other animal interest. As the title makes perfectly obvious, this is about a dolphin. 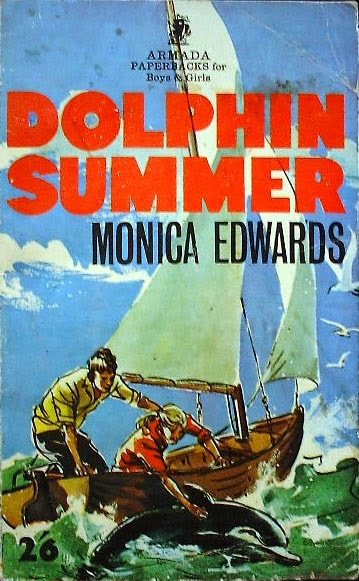 I thought when I read the book that Monica Edwards must have met dolphins herself, and I had a little sequence in my head where she and the real-life Meryon came across a dolphin as they wandered along the Sussex coast. All that was just a fantasy. Girls Gone By, when they republished Monica Edwards' books, have included introductions by Shelley Edwards, Monica's daughter, and I found out that Monica had never seen a dolphin of any sort, either wild or in captivity. To see one in captivity, Shelley wrote, would have upset her too much. I have a lot of sympathy with her there. I hate the aquarium displays where dolphins perform, and even more the ones where orcas do. It's just such a fate that motivates the action in Dolphin Summer. The dolphin attracts hordes of trippers, but also someone who wants the dolphin as a performer in a circus. You can probably guess the outcome of the story, but for me the whole book is given added poignancy by the quite terrifying description of the difficulties Tamzin gets into when she goes for a midnight swim. Up until then, she's always seemed immune from danger, no matter what situations she's got herself into. The night time ride in the floods to Rye always seemed positively miraculous to me - I couldn't quite believe they survived the trip without being swept away, but in Dolphin Summer all those lucky escapes finally catch up with Tamzin.